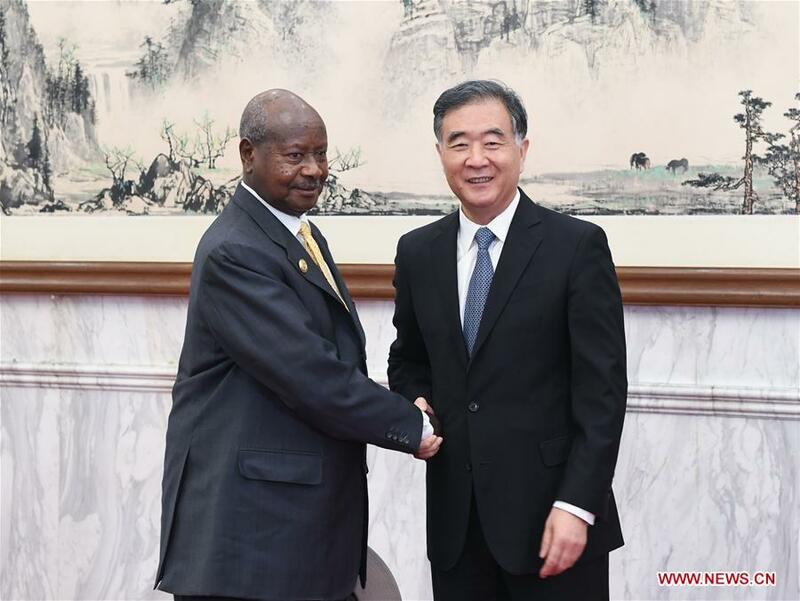 BEIJING, Sept. 6 (Xinhua) -- China's top political advisor Wang Yang on Thursday met with Ugandan President Yoweri Museveni after the 2018 Beijing Summit of the Forum on China-Africa Cooperation (FOCAC) concluded Tuesday. Wang, chairman of the National Committee of the Chinese People's Political Consultative Conference, said the Chinese and Ugandan heads of state met five times since 2013, which demonstrates the importance of the China-Uganda ties in China's relations with Africa. Wang said China is willing to work with Uganda to implement the important consensuses of the two countries' leaders and the outcomes of the FOCAC Beijing Summit, strengthen joint efforts to build the Belt and Road, help Uganda solve bottleneck issues in economic development and push China-Uganda cooperation toward greater outcomes. Museveni thanked China for its longtime firm support and selfless assistance provided to Africa and said more is to be learned from China in building a common market in Africa and boosting Uganda's economic development. He spoke of the need to deepen Uganda-China practical cooperation in fields such as trade, infrastructure, industrial parks and agricultural processing to benefit the people of the two countries.